Just like it did in 1989 with baseball cards, Upper Deck's debut on the ice took hockey card quality to a new level. It didn't hurt matters any that it has a loaded checklist filled with rookie cards of Hall of Famers and future Hall of Famers. The 1990-91 Upper Deck Hockey set has 550 total cards divided into two series. The first 400 are considered the Low Series and the final 150 make up the High Series. Both came with separate boxes, although High Series packs have a mix of all 550 cards. The design brought a glossy look to hockey. Cards have white borders that are complimented by a marble frame that's colored according to the player's team. Crisp photography is what makes the cards really stand out, especially when compared to the drab pictures used on a lot of O-Pee-Chee and Topps sets in the years leading up to Upper Deck's debut. Base card backs offer a cropped photo along with a variety of stats. The inclusion of a small anti-counterfeiting hologram on the back was a big deal at the time. 1990-91 Upper Deck Hockey is bolstered by several subsets that include some all-time greats and future superstars. These include All-Stars and Heroes of the NHL. Canadian Juniors are included in the High Series, offering rookie cards for many players who won gold for Team Canada at the World Junior Championship. Scott Niedermayer and Felix Potvin are among them. The top prospect in hockey at the time, Eric Lindros was under an exclusive deal with Score at the time. However, Upper Deck was able to sneak him onto a couple of multi-player Canadian Junior cards. 1990-91 Upper Deck Hockey marked the debut of the brand's trademark Young Guns. 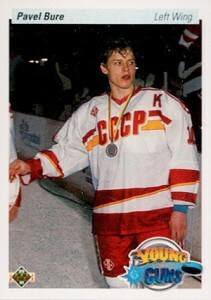 Another High Series subset, rookies here include Sergei Fedorov and Pavel Bure. This is Bure's only rookie card. 1990-91 was a very good year for rookie cards in hockey. The set has plenty outside of the Young Guns and Canadian Juniors subsets. 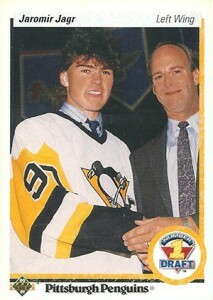 Draft picks cards include Jaromir Jagr and Owen Nolan. 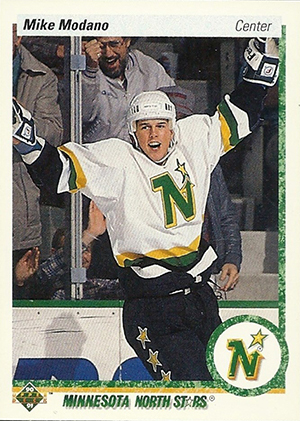 Mike Modano, Ed Belfour, Mats Sundin, Mike Richter, Jeremy Roenick and Rod Brind'Amour are among the other standouts with rookies in the set. With inserts only starting to gain popularity at this point, there's just one set of extra cards. Both series have randomly inserted holograms. The nine-card set includes Wayne Gretzky, Steve Yzerman, Brett Hull and Mark Messier. When tilted, the cards show movement. They can also be used as stickers. The technology has come a long way since then. 1990-91 Upper Deck French Hockey caused a major splash at their time of release. The cards are written in French but that's not why they were originally popular. They were believed to be much rarer. At one point, packs were selling for more than $20 each. However, it turned out the cards were not rare at all. Today, the French cards carry little to no premium over their English counterparts other than the novelty aspect. 1990-91 Upper Deck French has the same checklist. Like most everything from the era, 1990-91 Upper Deck Hockey is readily available still today. Prices are also extremely reasonable. While it might not offer a lot of value today, this is a great looking set with an excellent checklist. It's also the start of one of the cornerstone brands in hockey card collecting. 550 cards. Low Series #1-400, High Series #401-550. 9 cards. Cards are not numbered. I liked these cards when they first came out in 1990.Then they came out with the European set,look great,bought a lot,then got screwed by ud after there print run of 50,000. It’s still the same now,hockey beside Gretzky ,Orr , they seem to sign everything,don’t forget Howe who will have autographed death certificates. Come on,give us a break make low prints that don’t cost 650 a box. Loved these cards as a kid. Billdavis is right on that upper deck just kept printing more and more as everyone decided that sports cards were the next ‘can’t lose’ investment. But if you are a hockey lover, this is the best set from 1991 – and still available (as of writing) often for cheaper than new! I’m very glad since I can finally get all those cards I could never afford as a kid. Forgot to rate :p. Too bad they overproduced. Don’t buy as an investment. Buy for their beauty! One of best hockey sets for pure value. Great subsers & over abundance of hall of fame rookies. Also cards look great. Only severe overproduction keeps this from being a 5 star set. Loaded with hall of famers this is easily the best hockey set of 1990. OPC premier was also good but comes in at a distant second. Like all junk wax era sets it wont cost you very much but its a must have for anybody’s hockey card collection. Extremely nice set that helped usher in the mass overproduction of hockey cards. A great set to introduce your kids to the world of hockey card collecting and some nice nostalgia for HOF RC’s and “I remember that guy” for us older folk. I recommend looking on Kijiji for locals dumping these boxes as shipping costs alone exceed the value of the box. Keep in mind that the Gretzky and Roy promo cards (#241) will not be found in these boxes but can be had cheaply on eBay if you’re after the master set. For a real challenge, check out the 25th anniversary parallels found in 2014-15 UD S1 Hobby packs. These are foil stamped originals (all 550 cards plus the 2 promos, both auto’d) and hand numbered to 25. Some of these are autographed and will cost you large $$$. Why don’t they mention the real reason behind the UD French version craze in 1990? UD was very skeptical that French versions would sell, so they had planned a production run of only 600 cases. Once word of this got out to the public, everyone went crazy for the French version because they knew that it was a very limited product and thus the French version rookie cards would be much more rare and much more valuable. Once UD realized what was happening, they secretly had an ADDITIONAL 1,000 cases printed and shipped out to meet demand but did not tell anyone that they had nearly tripled the production run. That is why they were so popular but today they are not worth anything.